Seville is a city which is both charmingly charismatic as well as aesthetically pleasing. Therefore the Sevillanos (inhabitants) or Hispalenses (lending from its Roman name Hispalis) are able to receive the best of both worlds. Seville is the hottest major metropolitan area in Europe, with summer average high temperatures of above 35 °C. Summer is the dominant season and lasts from May to October. The city is situated on the plain of the River Guadalquivir, and its harbour which is located about 50 miles from the Atlantic Ocean, is the only river port in Spain. For the majority of the year, the city is enveloped by a beaming sunlight, it is the hottest major metropolitan area in Europe with average summer temperature of above 35°C. Summers usually last from May through to October. The Sevillanos are known for putting on brilliant performances in their cultural festivals. The Feria de Abril is a week long party of food, drink and dance where men and women dress and parade the streets. During Semana Santa (Holy Week), there are processions followed by huge baroque floats which feature images of the Virgin Mary or Jesus Christ, and of course surrounded by cheerful crowds. Dating back to its alleged ancient foundations rooted in Greek mythology, Seville being approximately 2,200 years old is one of the oldest cities in Europe. Legend states that the Andalucian metropolis was founded 3000 years ago by the Greek God Heracles (Hercules in Roman). Also commonly identified as the Phoenician God Melqart, it is reported that he sailed through the Strait of Gibraltar to The Atlantic, and founded trading posts at the currents sites of Cádiz and Seville. As with all of the Andalucian cities, Sevilla has several historical layers; starting with Roman origins, and transitioning from its rich Moorish era to its revolutionised Christian Kingdom. Seville is one of the oldest cities in Europe. Hispalis was the name which was first given to Seville by the Romans. Later, during the conquest of Hispalis in 712 it became Ishbiliya after the Muslim conquest. During the Moorish rule in Spain, Seville came under the jurisdiction of the Caliphate of Cordoba before becoming the independent Taifa of Seville. It was the capital of Al-Andalus until 717 when it changed to Cordoba. The Moorish architecture and urban influences are ever present in Seville, this can been seen in its fountains, courtyards and houses. In 1247, King Ferdinand lll of Castile and Leon began his conquest of Andalusia. First he conquered Jaén and Cordoba, then carried on to seize the surrounding cities of Seville which included Carmona Lora del Rio and Alcala del Rio. During this time he kept a standing army in the vicinity, the siege lasted for fifteen months until the city finally surrendered on 23 November 1248. After the conquest, public buildings including churches and cathedrals were constructed in the Mudejar style and also with Gothic architecture. Following the discovery of America in 1492, Seville became one of the economic centres of the Spanish Empire, making this one of its highest points in history. Seville’s port monopolised the trans-oceanic trading system. Its port monopolised the trans-oceanic trade and the Casa de Contratacion (House of Trade) wielded its power, which in turn paved the way for a golden age of literature and art. Seville’s importance during the 16th and 17th centuries was mainly attributed to the fact that it was designated capital of the Carrera de Indias. Also known as the Gateway to the Indies, this was the Spanish trading monopoly with Latin America and the only trading port with the Indies from 1503 until 1718. However, in the late 16th century, the monopolising stature of the port of Seville was crippled as the port of Cadiz was authorised into trade. By the 18th century, Seville’s international importance started to drop; after the Guadalquivir began to to silt, upriver shipping ceased and thus the city went into an economic decline. It wasn’t until the early 19th century that the city started to recover. Between 1825 and 1833, several architectural modifications were planned for construction. They played a key part in aiding the city to recover from its previous downfall. Melchor Cano was the chief architect alongside his collaborator Jose Manuel Arjona y Cuba. A lot of the industrial architecture that stands today has survived from the start of the 19th century. These include, the ceramics factory installed in the Carthusian monastery at La Cartuja in 1841 and now home to the El Centro Andaluz de arte Contemporáneo de Sevilla, which manages the collections of the Museo de Arte Contemporáneo de Sevilla. The Sevillian bourgeoisie invested in developments to boost Seville’s economy. Besides this, in the years that Queen Isabel ll reigned over Spain in the mid 1800’s, there was a rise in construction owing to the Sevillian bourgeoisie. They invested in developments which would be extraordinary for the city’s heritage. This included the Isabel ll bridge, also known as the Triana Bridge. As a result of this bridge being built, street lighting was increased in the city and most of the streets were paved during this time as well. Towards the second half of the 19th century, Seville began an expansion by way of a railway construction, which resulted in knocking down ancient walls and subsequently allowing the urban space of the city grow eastward and southward. In 1894 the Sevillana de Electricidad company was created to provide electric power throughout the municipality. Finally, in 1901 the Plaza de Armas railway station was launched. Later on, new public spaces such as Plaza de España and the Maria Luisa Park were created, and the Spanish government began a modernisation of the city by erecting new hotels and widening mediaeval streets to allow for automobiles to access. In 1929 Seville hosted the Ibero-American Exposition. Countries in attendance of the exposition included: Portugal, the United States, Brazil, Uruguay, Mexico, Perú, Argentina, Chile, the Republic of Colombia, Cuba, Venezuela, the Dominican Republic, Bolivia, Panamá, El Salvador, Costa Rica, and Ecuador. The purpose for holding this exposition was to improve relations between Spain and the countries in attendance, many of which were former Spanish colonies. Christopher Columbus and the New World. A notable fact about Seville is that it holds the tomb of Christopher Columbus the Italian explorer, navigator, colonizer, and citizen of the Republic of Genoa. This is most likely because Seville was the port from which Columbus and the Spanish conquistadors set off for the New World over 500 years ago. Under the patronage of the Catholic Monarchs of Spain, Isabella and Ferdinand, he completed four voyages across the Atlantic Ocean in an effort to initiate the European colonisation of the New World. However, it wasn’t straightforward, it took years of negotiations and requests at the Spanish court to finally have his voyage authorised in 1492. It was a strained relationship between Columbus and the Monarchs which included arrests, law suits and dismissals throughout his time of being 1st Governor of the Indies. In 1506 Columbus died in the Spanish town of Valladolid after his fourth and final voyage at sea. However, Columbus was not buried in one place, his travels continued long after his death. Initially, he was buried in the Carthusian monastery in Seville for over 20 years. His remains were then moved to Santo Domingo Cathedral in the Dominican Republic, as requested by his widow Maria de Toledo as it is told that his dying wish was not to be buried on Spanish soil. However, in 1795 when Spain lost control of the Dominican Republic, his remains were moved again to Havana, Cuba. 100 years later, they made their final voyage back home to Seville, and placed in the cathedral where you can visit him today. Lastly, there was a discovery in Santo Domingo in 1877 of what could be the ‘real’ remains of Christopher Columbus. The remains came in the form of a box with the inscription, “The illustrious and excellent man, Don Colon, Admiral of the Ocean Sea.” Although DNA examinations were done with the remains in Sevilla and matched closely, tests were not permitted to be carried out with the remains found in Santo Domingo. This in turn led to the realisation that he could in fact be buried in either Santo Domingo or Seville, or even both! The old town of Seville, with an area of 4 square kilometres is one of the third largest in Europe. It contains three UNESCO World Heritage Sites which are; The Alcazar Palace, The Cathedral and the General Archive of the Indies. These sites incorporate vestiges of Islamic culture, centuries of ecclesiastical rule, aristocratic dominance and the trading power that Spain accumulated through its colonisation of the New World. 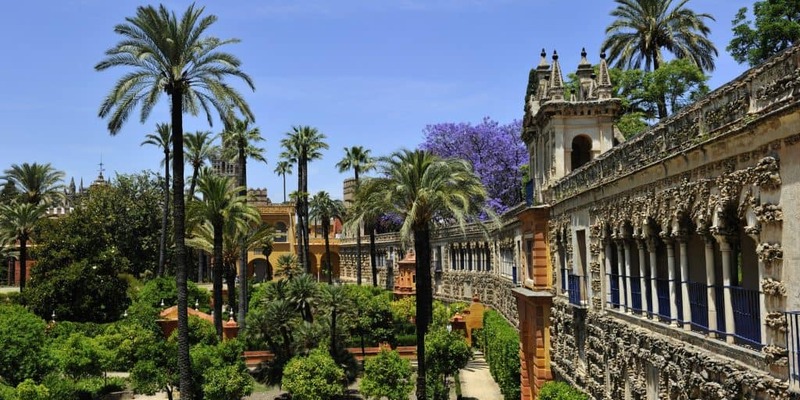 Seville is home to three UNESCO World Heritage Sites. The Royal Alcazar of Seville is a royal palace in Seville, and is recognised as one of the most outstanding examples of mudéjar architecture on the Iberian Peninsula. Originally, the Alcazar was constructed during the 10th century, as the palace of the Muslim governor. Today, the castle is used as one of the residences for the Royal Family. Thus, it retains the same purpose for which it was originally built, as a residence for monarchs and heads of state, and is the oldest royal palace still in use in Europe. The building itself which has been built and rebuilt many times over, is comprised of magnificent frameworks and large gardens. The Alcazar adopts several different architectural styles. From its origins of being an Almohad Palace (which can be seen in the ‘Patio del Yeso or the Jardines del Crucero), to its Spanish Mudejar art in the Palacio de Pedro l and in conjunction with other constructions displaying cultural styles from the Renaissance to the Neoclassical eras. The Cathedral, founded in 1403 which was built on the site of a former Mosque, is built in Gothic and Renaissance style, and covers over seven centuries of history. It currently stands as the largest Gothic building in Europe and since its establishment, it has continued to be used for religious purposes. The Giralda, which is the name given to the bell tower was a former minaret of the mosque, and the top section of the tower was built in the Renaissance period. This demonstrates the importance of its religious and cultural syncretism. The Seville Cathedral is the largest Gothic cathedral and the third-largest church in the world. The Archivo de Indian building was constructed in 1585 to house the Casa Lonja or Consulado de Mercaderes de Sevilla (consulate of the merchants of Seville). In 1785 it became the Archivo General de Indias, and since then it has become home to the greatest collection of documentation concerning the discovery of and relations with the New World. Designed by Juan Herrera (the architect responsible for completing El Escorial), it is one of the biggest examples of the cultivation of Spanish Renaissance architecture, Baroque Andalusian architecture and Spanish neoclassicism. Ultimately, signifying the link between the Old and the New World. The Palace of San Telmo, named after Saint Elmo, the patron saint of navigators – was first built in 1682 as a home for orphaned children of sailors and then a marine academy to train ship’s pilots, navigators and high ranking officers. Later, it became a royal palace, with private estates that reached as far as the Parque Maria Luisa; hereafter a seminary and a hospital. After its dilapidation in the mid-20th century, the palace was refurbished in the 1980’s and now stands as the presidential headquarters of the Junta de Andalucia (The Andalusian Autonomous Government). It is one of the most emblematic buildings of baroque architecture, famous for its churrigueresque principal façade and grand chapel. In 2011, the Duke and Duchess of Cornwall were received in the palace on their ten day tour of Spain, Portugal and Morocco. The Prince and The Duchess were met by regional President Jose Antonio Grinan Martinez at his offices in the 17th Century San Telmo Palace. The “Torre del Oro” (Tower of Gold) is a dodecagonal military watchtower built by the Almohad Caliphate. It was used as a defensive barrier on the river to control access to Seville via the Guadalquivir river. The tower first dates back to the 13th century, the 12-sided lower part was built in stone by the Almohades, while the upper brick mini-tower was added in the 18th century. Legend states that during the invasion of the Americas, the tower was used used to house gold which had been plundered from from the Mayans and the Incas. Some say that this is where its name originates from, others have interpreted it to relate to its outside tiles which flashed like gold in the sun. The tower is now home to a naval museum, showcasing maritime memorabilia, portraits of naval figures and documents relating to overseas discoveries. The Royal Tobacco Factory, is a stone building constructed in the 18th century, and was the first tobacco factory constructed in Europe. Now, used by the University of Seville, it is one of the most illustrious and splendid examples of industrial architecture from the era of Spain’s Antiguo Régimen. It is also the second largest building in Spain after the monastery El Escorial. Since the mid 20th century, the Old Tobacco Factory has been the seat of the Vice-Chancellor of the Universidad de Sevilla and some of its Faculties. Other notable industrial architecture that has survived from the 19th century includes the ceramics factory at the Monastery of the Cartuja; established by Englishman Charles Pickman after he acquired the Carthusian Monastery in 1839. Pickman established innovative manufacturing methods such as, importing raw materials, the use of moulds and incorporating specialised machinery. The old monastery is now home to the Andalusian Contemporary Art Centre (The Centro Andaluz de Arte Contemporáneo).